We hope to see you at our next Choosing to Care Conference! Our 2020 Choosing to Care Conference is already in the works! We look forwarding to seeing you there. Check back this fall for additional details. In the meantime, join us for our Learning to Care Workshops. 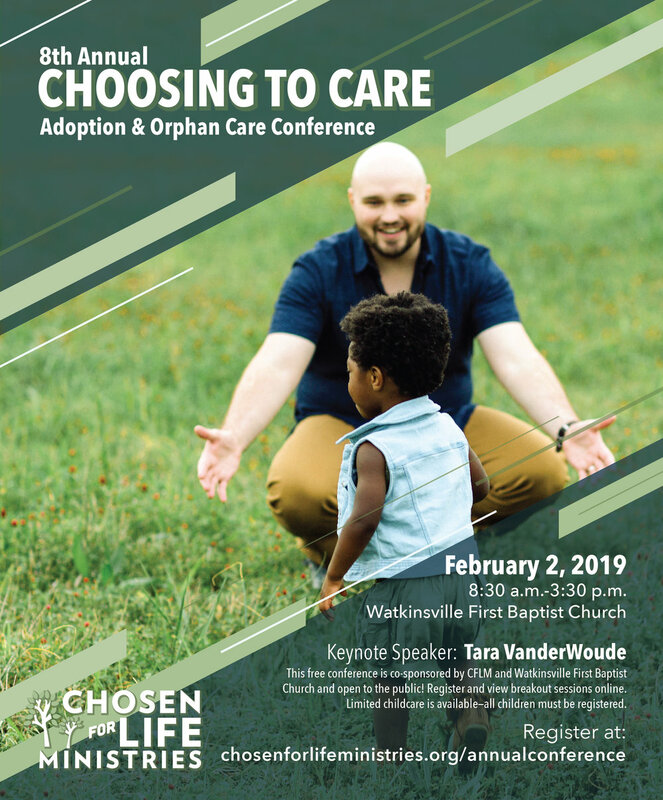 Our 2019 Choosing to Care Conference was held on Saturday, February 2nd, 2019 at Watkinsville First Baptist Church! Our 2018 Choosing to Care Conference was held on Saturday, February 3, 2018 at Watkinsville First Baptist Church! Our 2017 Choosing to Care Conference was held on Saturday, February 4th, 2017 at Watkinsville First Baptist Church! Our 5th Annual Adoption and Orphan Care Conference was held on Saturday, Feb. 6, 2016 at Watkinsville First Baptist Church. 2015 CHOOSING TO CARE CONFERENCEOur 4th Annual Adoption and Orphan Care Conference was held on Saturday, Feb. 28, 2015 at Watkinsville First Baptist Church. Our 3rd Annual Adoption and Orphan Care Conference was held on Saturday, Oct. 19, 2013 at Watkinsville First Baptist Church. Post Adoption: I’ve adopted, now what? Our 2nd Annual Adoption and Orphan Care Conference was held on Saturday, Oct. 13, 2012 at Redeemer Presbyterian Church. Our 1st Annual Adoption and Orphan Care Conference was held on Saturday, Oct. 15, 2011 at Redeemer Presbyterian Church.